The Rogue RA-090 Dreadnought Acoustic Guitar is an incredibly affordable quality guitar aimed towards the beginner musician! For its price, the quality is pretty amazing with its strong mid-range and ability to produce a bright, beautiful sound. First of all, this is a 6-stringed, right-handed, dreadnought design with a whitewood body. This makes it a standard size making it difficult for a child to learn (with their small body frame and small hands) but perfect for the aspiring teenager guitarist. At the same time, the standard size specializes in creating a rich sound, especially in the mid-range. The guitar finally finishes with mahogany in the back to give it a classic look. The fretboard material is made of rosewood and is slightly curved to not only give the notes a bit more clarity but also allows for easier movement sliding up and down the fret. The frets feel good when you play and you are able to accurately play with a light touch. This guitar also comes with a nato neck design to help sustain the notes and create a consistent tone with the finish of the top material being made of spruce. The strings come metal (so beginners be prepared!) The strings are apparently incredibly durable so you won’t have to worry about them breaking anytime soon! It also comes with nickel hardware (which will age nicely with use) and covered tuners. There is an incredible amount of versatility with over 5 classic designs to choose from: Natural, Black, Mahogany, Sunburst and Satin Sunburst. One of the cons though is that this guitar is strictly acoustic so you won’t be able to plug it into an amp and blast at your garage! 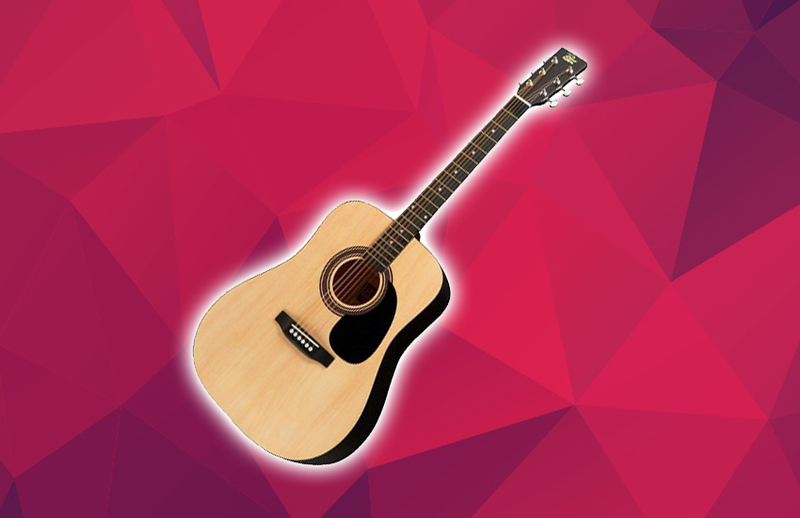 This guitar is actually a playable instrument right out of the box with a decent sound making it a great value. However, like many guitars, a proper setup will make it sound better. Although the medium strings work perfectly fine, you may want to consider using light strings and see how they feel and if it produces a better sound or feels better. 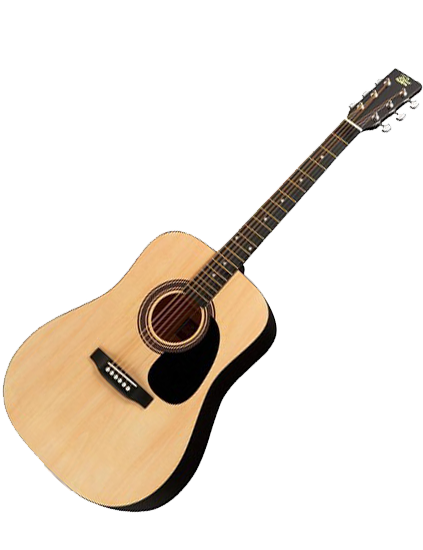 We think the Rogue RA-090 Dreadnought Acoustic Guitar is perfect for the aspiring beginning guitarist who would like to play the guitar. 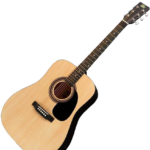 Overall, if you are looking for an acoustic guitar under $200, we consider this guitar worthy for a beginner to try out and play!